ISRAELI WOMAN IN PARLIAMENT = MURDER ALL PALESTINIAN MOTHERS WHO BREED LITTLE SNAKES AND FLATTEN THEIR HOMES! | Concise Politics -- Your Time should NOT be wasted. ISRAELI WOMAN IN PARLIAMENT = MURDER ALL PALESTINIAN MOTHERS WHO BREED LITTLE SNAKES AND FLATTEN THEIR HOMES! SHE DOES NOT DENY that she made the remarks. MURDER ALL PALESTINIAN MOTHERS WHO BREED LITTLE SNAKES AND FLATTEN THEIR HOMES! ISRAELI WAR CRIMINALS = END ALL USA RELATIONSHIPS WITH ISRAEL = WELFARE + CONTRACTS + SUPPORT OF ANY KIND = COMPLETE SANCTIONS AGAINST ALL THEIR PRODUCTS AND SERVICES! 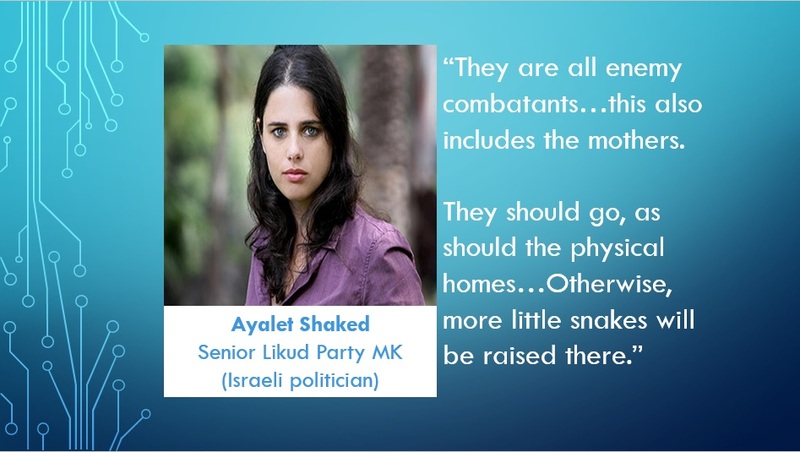 Shaked = Foul and vicious statements = NOT ambiguous and this isn’t just hyperbole = This woman is a GENOCIDAL monster. Shaked’s remarks = Calls for genocide and declares all Palestinians are Israel’s enemies and must be killed. Genocide = Deliberate and systematic extermination of a national, racial, political, or cultural group. USA MSM = Virtually silent on the genocidal war crimes by Israelis. USA MSM = Story told is Israel is fighting terrorists = But fact is Israel attacks Palestinian refugees + Mass Murdered 630 Children + 420 College Students + BOMBED UN Protected schools + Ambulances + Flattened 4 Hospitals + 75+% of those murdered were civilians. This isn’t a war between two sides. It is ethnic cleansing. The Turkish premier said Israel’s policy in Gaza is no different than Hitler’s mentality. This entry was posted in ISRAELI WOMAN IN PARLIAMENT = MURDER ALL PALESTINIAN MOTHERS WHO BREED LITTLE SNAKES AND FLATTEN THEIR HOMES! and tagged ISRAELI WOMAN IN PARLIAMENT = MURDER ALL PALESTINIAN MOTHERS WHO BREED LITTLE SNAKES AND FLATTEN THEIR HOMES!. Bookmark the permalink. ← HOLLYWOOD MOVIES + CORPORATE PROPAGANDA + FALSE FLAGS = FEAR MONGERING WARS = STAGED ATROCITIES THAT TRANSFER WEALTH TO THE SUPER-RICH – A GAME OF A FEW RICH MEN VERSUS LOTS OF POOR MEN AND WOMEN HAVING THEIR WEALTH AND FUTURE EXTRACTED BY WAR.